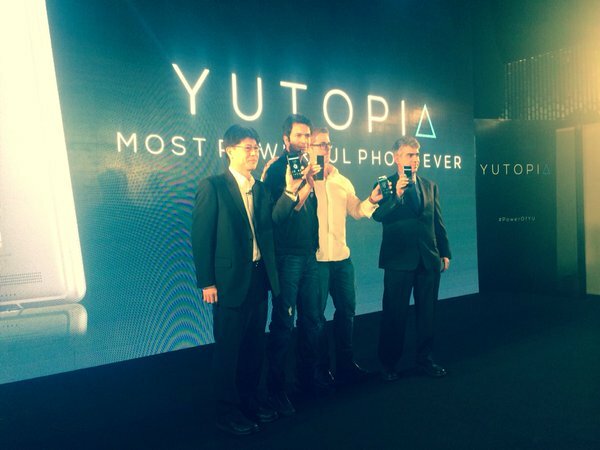 After months of teasing YU has finally unveiled it's first flagship device Yutopia also known as YU5050. The device which has been in the news ever since it's specifications were leaked on GeekBench (as reported first by YSP Blog) back in September. The device dubbed 'World's Most Powerful Phone' or 'The Beast' by the company was released today by Rahul Sharma founder and CEO of YU Televentures in a live event. The device which is run by 64-bit Qualcomm Snapdragon 810 clocked at 2.0 GHz comes with 5.2" 2K QHD screen with 4 GB of RAM and 32 GB internal storage which can be extended upto 128 GB external storage. The device comes with 21 MP rear camera from Sony and 8 MP front camera with Full HD support and PADP. Yutopia is powered by 3000 mAh battery which also comes with QuickCharge 2.0 for rapid charging. Design wise it is encased in metal body with Camera Ring first seen in Yuphoria. It also has FingerPrint Scanner for security as well as for taking slefie. The device runs Cyanogen OS 12.1(Android Lollipop v5.1) out of the box with a planned upgrade to Cyanogen OS 13.0 ( Android Marshmallow v6.0). Most interesting fact is that the device will be 'Made In India' just like Yuphoria and Yunique. The device has been priced at ₹24,999 and will be available on Amazon India. Pre-booking starts at 4 PM and delivery will start on 26th December, 2015. 2. Assured buyback & upgrade to Yutopia 2. 3. Discounts on Zomato, Ola, Ixigo. So tell are you excited or disappointed with the Beast Yutopia and will you buy the device or not. Sign of your thoughts in the comments below. Also Read: YU Yutopia complete specifications, USB OTG Support, Camera Details, Sensors etc.